I hate it when life gets so busy there’s not time for blog posts. They start to stack up mentally in a queue like unread books. Since the holidays are still too far away to look to them for spare time, I’m just going to pop out several mini-posts this weekend. 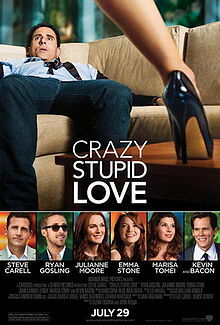 The first is a passionate rave for Crazy, Stupid, Love. I saw it with my wife in August but still laugh just thinking about it. And cry. In a word, it’s the best romantic comedy in at least a decade. It’s as funny, if not funnier, than Little Miss Sunshine. But it’s also heartwarming in a way that does that overused term proud. Most of all, it is so brilliantly written, directed, and acted by every single cast member that you leave the theatre just tingling with joy. I saw one review in the New York Times that said Crazy, Stupid, Love proves they still know how to make romantic comedies. Wrong. This one proves they know how to make them even better. P.S. Don’t waste the chance — see it with your sweetie. 2 Responses to Love, Crazy, Stupid, Love.